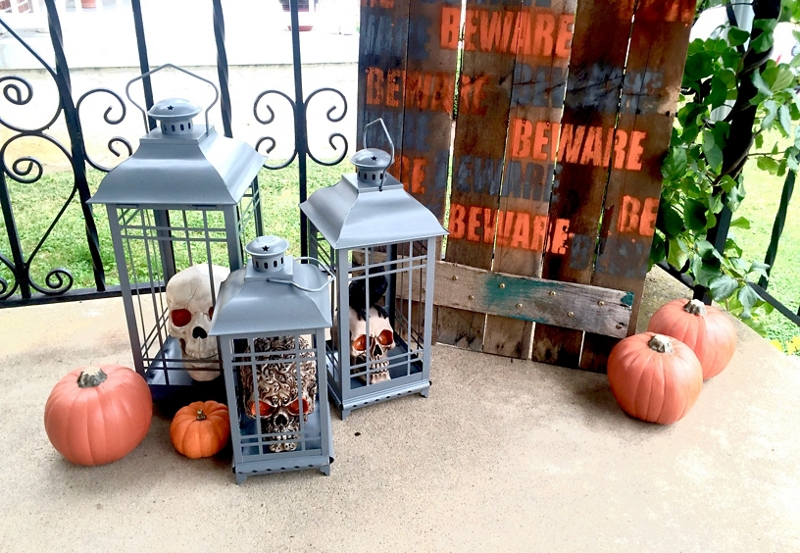 Create a haunted porch scene for Halloween using Krylon®. Set up and protect an area to spray paint either outdoors or in a well-ventilated area. Carefully prepare the lanterns and skulls, ensuring the surface is clean, dry, and dull. Take lanterns apart, carefully separating the base and the lid. Lay the lid of the lantern in front of the base. After reading can label for proper application and safety instructions, spray light coats of Krylon® SUPERMAXX® ALL-IN-ONE in sweeping motions onto the base and lid of the lanterns. Set aside to dry. Tape off the skulls, leaving the eyes exposed. In sweeping motions, begin to spray light coats onto the skulls with Krylon® SUPERMAXX® ALL-IN-ONE in Gloss Mandarin. Allow time to dry. Once the Gloss Mandarin is completely dry, apply coats of Glowz glow-in-the-dark paint in Orange. After the lanterns and skulls are completely dry, remove the tape from skulls, and place one inside of each lantern. Place the tops back onto the lantern. Use the pallet wood to help space and align the perpendicular braces to attach the pallet wood together. Using Miter Saw, cut braces to the desired length. Using Impact Driver, and Fasteners, attach braces to the pallet wood. Place stencils in desired patterns and spray them onto the wood using Krylon® SUPERMAXX® ALL-IN-ONE in Smoke Grey, Gloss Mandarin, and COVERMAXX® Citrus Green. Allow time for paint to dry completely.